What is the Consumer Confidence Report? The consumer confidence report is a survey conducted by the Conference Board that measures consumer attitudes about both the present and future situation of the U.S. economy. Each month, five thousand consumers across the U.S. are interviewed and survey about their thoughts of economy. Their answers are then graded under different, weighted components and later compiled to give us one number that makes up the Consumer Confidence reading. Why Should I Pay Attention to this report? Consumer confidence is basically a measure of how good (or bad) consumers think the economy is performing. The more confident consumers are about the economy and their personal financial situations, the more likely they will be willing to shell out their hard earned cash. On the other hand, if consumers are concerned about the state of the economy, chances are they’ll hold back on spending right now, and instead save their cash for a rainy day. Keep in mind that the consumer consumption accounts for about two-thirds of U.S. GDP. That said, having an idea what consumers feel and how it could affect their spending habits could provide valuable insight with regards to predicting which way the economy may be headed in. Is there really a correlation between Consumer Confidence and Spending? I decided to do a little digging of my own to see whether consumer confidence does affect spending. 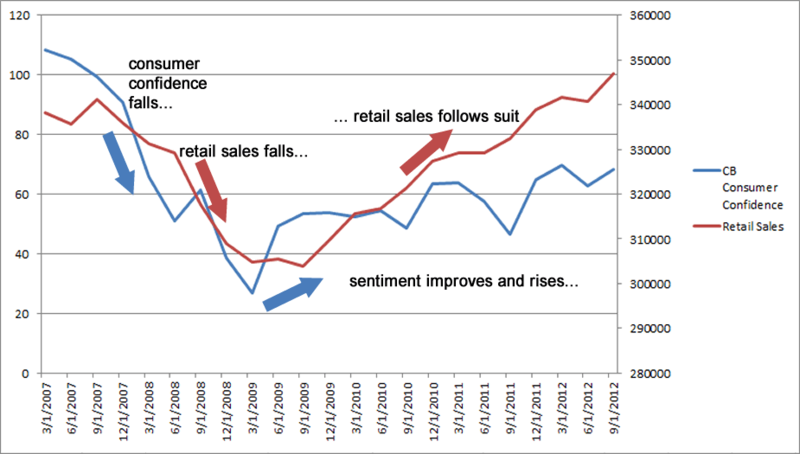 As it turns out, there appears to be a positive correlation between retail sales and the consumer confidence report. In 2007-2008, consumer confidence dropped as the Great Recession was taking place. During this time, retail sales also stumbled, falling from 340 billion USD to 305 billion USD. Then, once the Conference Board index bottomed out at 25.0 in early 2009, we saw retail sales start to pick up as well. Over the past few years, both consumer sentiment and retail sales have seen steady growth. No, the correlation isn’t pitch perfect, but at the very least it provides support for the argument that consumer sentiment does have predictive qualities in terms of predicting the direction of retail sales growth. That said, we should continue to measures this relationship, as it could give us hints as to how well the rest of the U.S. economy may perform this 2013. Should confidence continue to rise, retail sales may follow suit. This could have a ripple effect on the rest of the economy, as more spending will allow businesses to expand, which could in turn lead to them hiring. Before you know it, NFP figures are starting to hit the 200,000 mark, while GDP growth is steadily climbing each month! Make sure you hit up our economic calendar every last Tuesday of the month to find out the results of the Conference Board Consumer Confidence report! Do you think the recent uptrend in the consumer confidence report is warranted?